New York Library's 2009 list of "100 Titles for Reading and Sharing"
Apolonia "Lina" Flores is . . . a best friend (even though Vanessa's now completely boy crazy), a science lover (although her dad thinks she likes English just because he likes English), a pobrecita ("poor baby," what Vanessa's mom has called her ever since Lina's mom died), a sock enthusiast (or sockiophile? ), and in love with Luis (shh, don't tell him!). Like cascarones, hollowed eggshells filled with a bright rainbow of confetti, Lina is many different colors all in one. She's a daughter to her book-obsessed dad, a plain-Jane best friend to beautiful Vanessa, and a girl with a major crush. 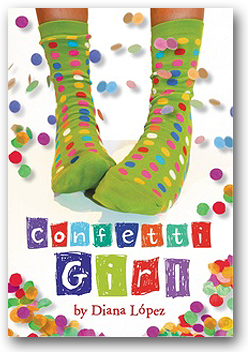 With a sweet, honest, and funny voice, Confetti Girl is a heartfelt story filled with joy. "Like a cascarón, Lina's life is full of colorful people and events, and you will want to read about every single one of them in this witty, honest novel." "An appealing coming-of-age novel set in a traditional Mexican-American town, in which Hispanic teachers, students and parents celebrate traditional American holidays such as Thanksgiving alongside such traditional Mexican observances as el Día de los Muertos and a quinceañera. Local idioms of Spanish proverbs—dichos—used as chapter headings enlighten both characters and readers." "López effectively portrays the Texas setting and the characters' Latino heritage....This debut novel puts at its center a likable girl facing realistic problems on her own terms." "López weaves Lina's bilingual and bicultural upbringing into the narrative seamlessly, giving young Latina readers an added element to connect with." "Although Confetti Girl takes on a serious subject matter, it's also about fun, a whole semester's worth, which includes confrontations with the school's most popular boy, a school festival, volleyball, friendship, boy craziness, a quinceanera and trips to the beach—and the counselor's office." 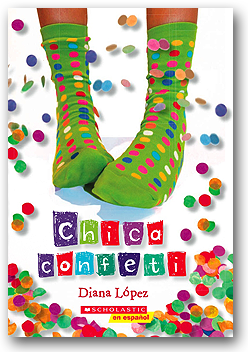 "Like the colorful cascarones López writes about, Confetti Girl is bursting with heartwarming cheer." "A great set of characters and a fantastic story . . . . A book unread is a life unlived. So, live this book. Live its humor, its sadness, and ultimately, its great joy."